Stirling coming out of retirement. This unassuming old man here on the right, Iain Stirling, is amazing because he upends some Netrunner norms. This week on PopMatters, I'm back to the subject of the Netrunner LCG. This post does not go in depth into the basic mechanics of the game, which I do better when I last spoke about asymmetrical play here. I recommend you give that a read to understand one of the reasons this game is so special. 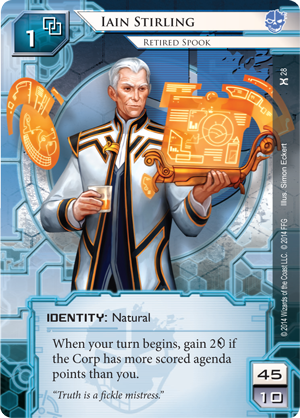 For yet another reason, you can also check out my previous article on the politics of Netrunner. This most recent expansion set adds some really interesting political flavors to the game as well. While this post is mostly on Stirling and the way he lends himself to a particularly exhilarating style of play, I should say that Honor & Profit, the latest deluxe set of cards, intelligently shifts the meta around in a variety of ways. Guard, for example, directly responds to some of the early game assault Criminal factions consistently dish out. Tennin Institute supports a slower and more drawn out game than what populated the meta, bolstered by cards like Diversified Portfolio and The Future Perfect (holy crap, this card). Runners saw their own answers to the dominant "fast-advance" strategy with tools like Legwork and Donut Taganes. Interestingly, some old cards that were scoffed at upon release are now actually played and well regarded. The dedicated central breakers open up the playing field for crazy tricks with Notoriety and Quest Completed. It's always been a fun time to be a Netrunner playful, but I don't think the game design has ever been this playful.